A flowering rhododendron in macro framing a blurred, more distant view of Vallgraven, the Gothenburg city moat. This week’s photo I originally posted on 25th May 2014 at GBG365. 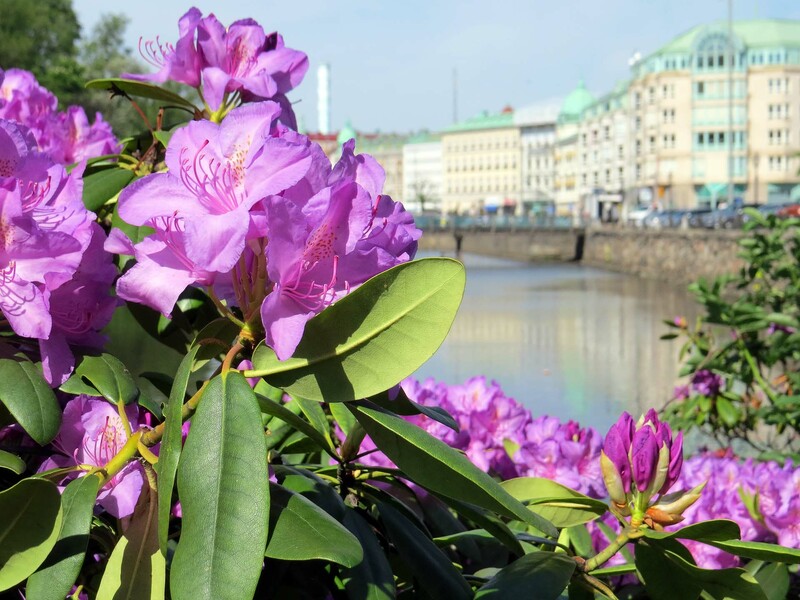 I chose it as this week’s photo because the rhododendrons of Gothenburg are once again in full bloom in this early high-summer weather. This is a photo I might have taken yesterday instead of four years ago. Vallgraven – the moat – is the most visible remnant of the massive defensive structure that once surrounded Göteborg. At one point this was the most well defended city in northern Europe, but its defences were never put to the test. I’m thinking now of the castle that dominates Namur (see my post from earlier this week). Also a massive fortification – though it was separate from the city. The walls and redoubts and the moat that once surrounded Göteborg were built to protect the whole city. In the 19th century their pointlessness finally apparent, the most of the defences were demolished. Where the walls stood, the land went mostly to housing. The redoubts – Skansen Lejon and Skansen Kronor – remain intact. A part of the walls stand still over Esperantoplatsen and some massive foundations are visible in the basement of the Biopalatset cinema complex . Otherwise it’s only some street names – the Larmgatans, Arsenalgatan – that preserve a flavour of the city’s martial history. The moat remained as a picturesque feature and because it linked to the city’s canal system. Beyond the moat, open land that had been kept free of structures to allow a field of fire from the city walls was planted as a park – with, among other plants, rhododendrons.